Organic fertilisers are those that contain nutrients from naturally occurring sources, such as seaweed, animal waste and blood; giving you a responsible and non-artificial way of caring for your garden. The fertilisers in our approved organics section have all been endorsed by organic farmers and growers so that you know they meet certain standards. Our organic fertilisers can be used on a variety of different areas of your garden, so please read the product descriptions of each to determine which will work best for the results you hope to achieve. 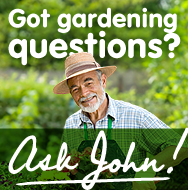 If you have any questions that still remain unanswered then you can always ask John, our resident gardening expert, who will be able to get back to you with a response to your specific question.